I met Stef Ferrari at ice cream college. She sat one row ahead of me in the giant conference room that served as our lecture classroom. On the first day, she was eating candy for breakfast. At our mid-morning break, she joined me in line for an ice cream sundae. Her bright red hair made her easy to spot. At afternoon break, she told me how good the chocolate milk was. 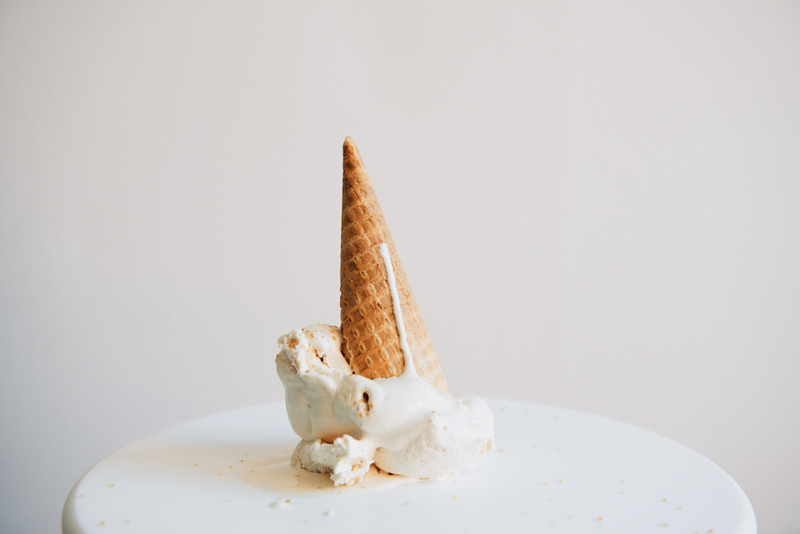 As ridiculous as this sounds, I liken my experience in ice cream academy to a short stint in the military–the hours were long, the information was overwhelming in quantity and complexity, and it was January in Eastern Pennsylvania. These are conditions under which you bond rather quickly. I soon learned that we both lived in Brooklyn, and by the spring, Stef would open her own ice cream shop in the neighborhood next to mine. The shop, named Hay Rosie for her mother, is now shuttered, but I spent that summer visiting more times than was reasonable or healthy. When Stef told me she was penning a book, it made me very, very happy. Firstly, for selfish reasons: I wanted to eat flavors like Mexican Muscovado Caramel, Lemon Bar, and Bananas Ferrari again. But I was also happy for everyone else who’d buy the book. Stef in an unrepentant food geek: this was true when she worked in the craft beer business, and remained true when she built custom ice cream equipment for her shop, so she could homogenize her own bases. I knew Stef would approach this collection of make-at-home recipes with her trademark level of obsessive detail, curiosity, excitement, and openness. I knew these qualities would result in successful, delicious recipes. One last thing you should know about Stef, she loves ice cream. She LOVES it. It’s a part of who she is. Ice cream is what first connected us, and is something we collectively nerd-out about to this day. I am so excited to cook from this book. Congratulations, friend. I chose a simple recipe from the book to share with you, but Ice Cream Adventures is full of new and inventive recipes like Peychaud’s Bitters Whipped Cream, Cacio e Pepe Ice Cream, Tomato Caramel Sauce, Fennel and the Goat Ice Cream, Pretzel Honey Mustard Ice Cream, India Pale Ale Ice Cream, Olive Oil and Vanilla Lime Milkshake, Melted Ice Cream Pancakes, Sage Chocolate Chip Ice Cream, Sriracha Popcorn Ice Cream, and Strawberry Pop-Tart Ice Cream–to name just a few. Stef has generously offered a copy of her book to one lucky reader. Just leave a comment describing your favorite ice cream flavor, your favorite ice cream shop or recipe, or the strangest ice cream flavor you’ve ever had. Giveaway closes on June 15th. 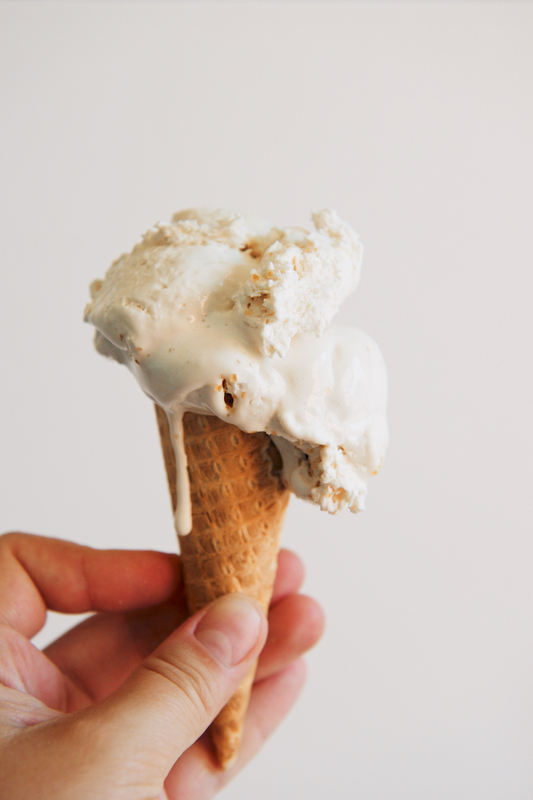 “Deeply rich, dark muscovado sugar responds with enthusiasm to the tang and lush texture of sour cream in this base.” (Note: “whipped topping” means cool whip or truwhip; don’t use whipped cream in its place.) Yields about 1 1/2 quarts. Reprinted with permission from Ice Cream Adventures, by Stef Ferarri, copyright © 2016, published by Rodale. 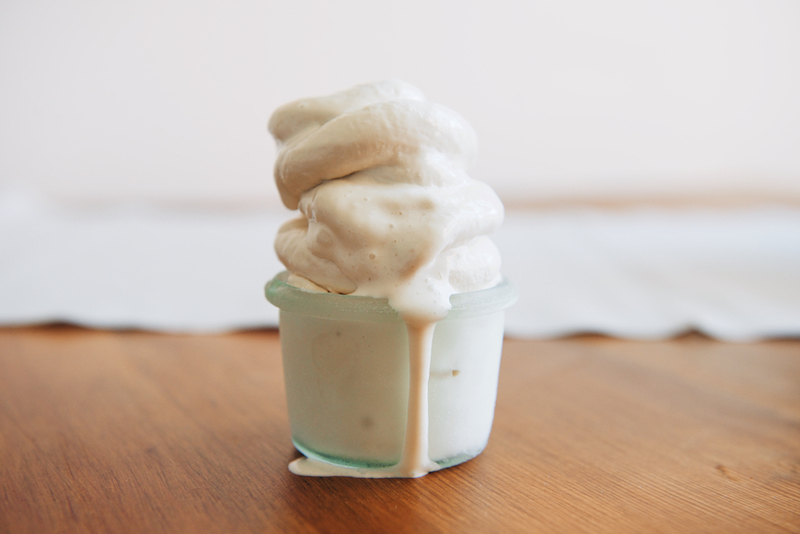 In a bowl, gently fold together the whipped topping, milk, sour cream, and sugar, taking extra care no to deflate the air from the whipped topping. 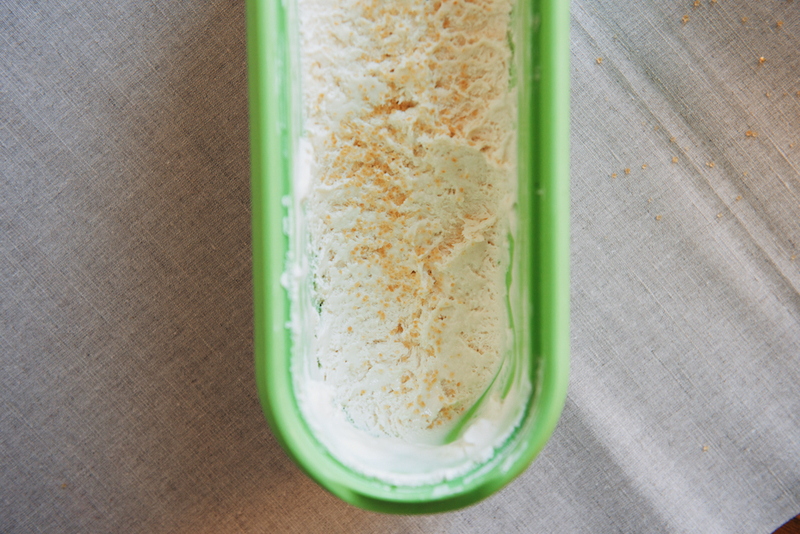 Once well integrated, store in an airtight container and freeze overnight. 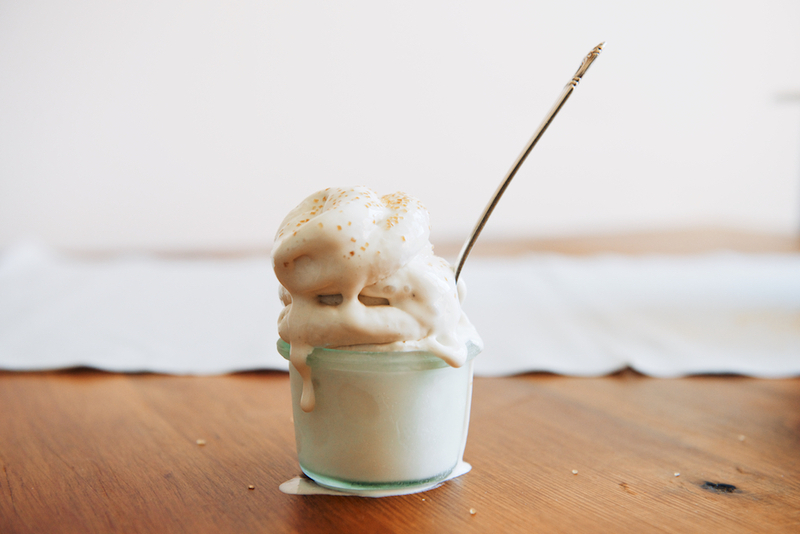 I love that this ice cream recipe uses sweetened condensed milk to achieve a luscious texture without needing an ice cream machine. Last week, I likewise tinkered around in the kitchen and made strawberry, goat cheese, and basil ice cream, with the help of some sweetened condensed milk. It’s a new favourite flavour! This sounds amazing!! I’ve tried haggis ice cream before. I would not recommend it! i love a simple really good vanilla..the one where the specks of vanilla shine through! My weirdest favorite flavor would have to be sweet corn and blueberry. Im surprising combination to someone not from the Midwest but I love it! 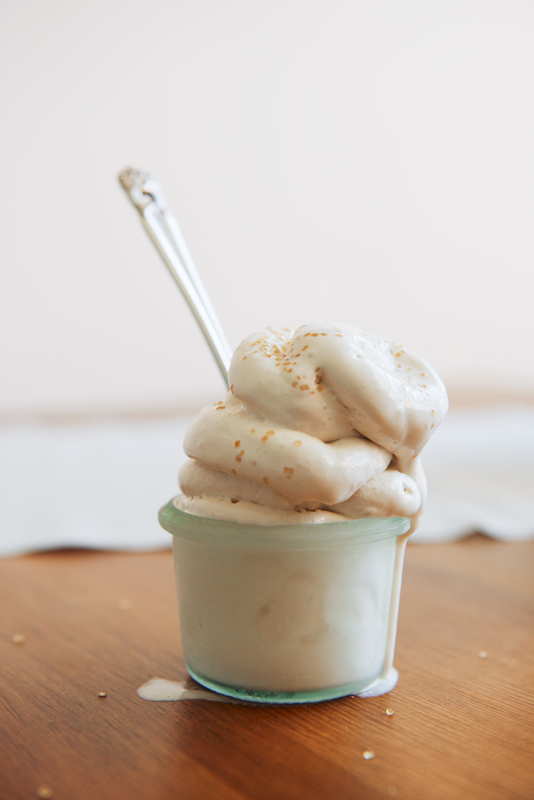 First of all, great blog post and major congratulations to Stef on her ice cream book! When I was a kid, my family used to drive a few miles from our Catskills country house to a little hamlet called Loch Sheldrake in the town of Fallsburg, NY. At the top of Sheldrake Pond, there was an old fashioned ice cream stand that served the most delicious soft serve that I can remember. We’d sit on the grassy hill and point at the houses across the pond and play games that don’t require anything but yourself. The ice cream would drip on our legs and our hands would be a sticky mess by the time we were done and it was just the greatest treat ever. Sadly, the stand is no longer there, but every time I drive past it… it makes me so happy. Thanks for writing, Sylvie! I’d love to visit a hamlet called Loch Sheldrake–it sounds enchanting! the whole idea of this book just took my breath away! 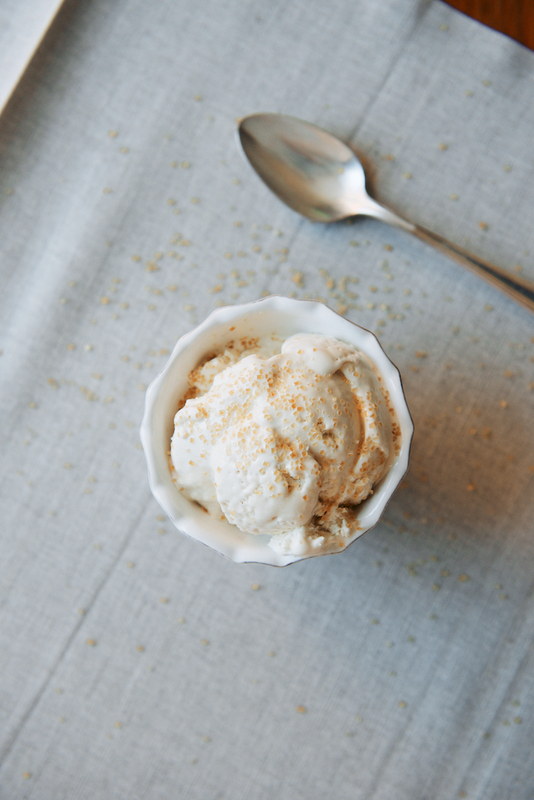 i love to make ice cream — especially savory ones. have made balsamic-roasted tomato basil; have served avocado ice cream in a little bowl of gazpacho; and a dollop of parmesan ice cream on an open-faced artisan BLT is a great hot summer day dinner. and i’m so glad to have found this blog! i will be back often. thank you! 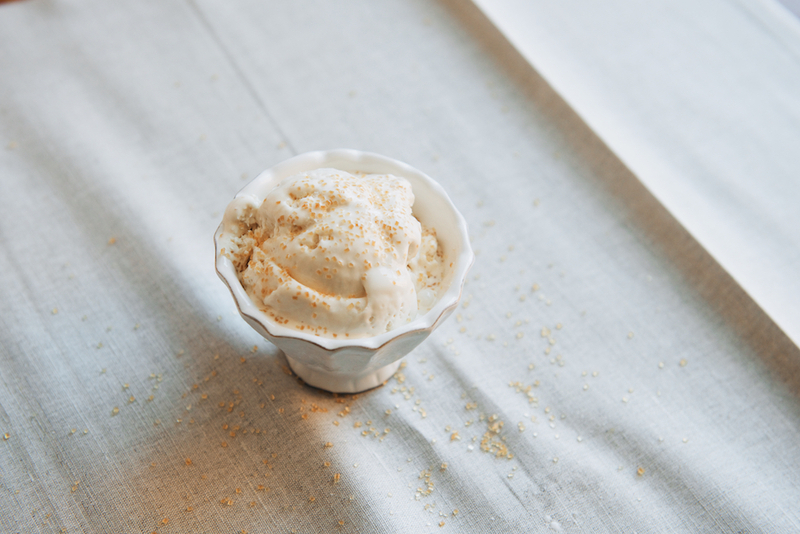 Honey rose Geranium ice cream. It’s subtle, sweet, floral, rich, and creamy—with an undeniable earthiness from the rose geranium. My favorite ice cream shop is Mount Desert Island Ice Cream in Bar Harbor, Maine. I’ve been going up there to hike in nearby Acadia National Park with my family every year since I was very young; it’s a tradition with us to drive into town after scaling our first peak and indulge in their amazing flavors. My personal favorite is their Fresh Blackberry while my brother goes for Callebaut Chocolate (though as he’s grown up he’s recently switched to Atlantic Brewing Stout with Fudge). Check them out! Thanks for the post; I’m always on the look for ice cream recipes that don’t require a machine, though I should probably invest in one soon. I went there on a road trip to Maine a few summers ago; delicious! I’ve been wanting to go to ice cream university for years! So fun to see a post about it. You are a very sweet friend and your friend Stef sounds like a hoot. 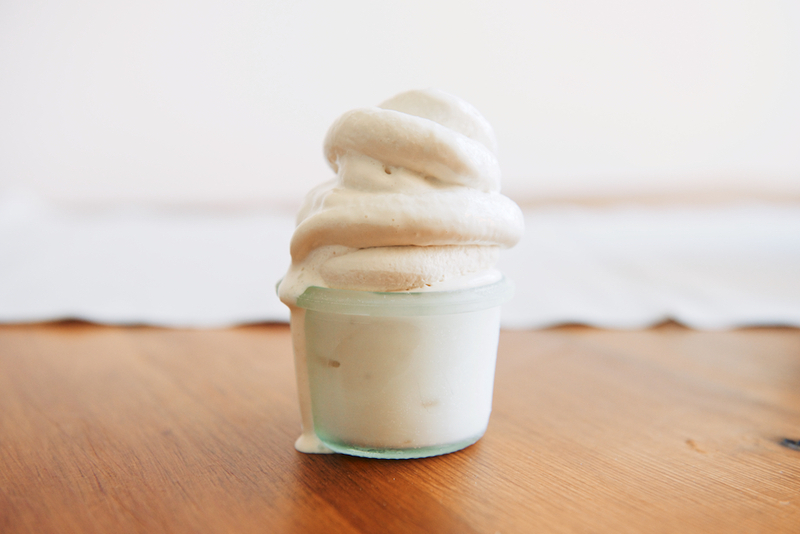 I love that she pasteurized her own base… That is TRUE homemade ice cream!! I cannot wait to get a copy of this book. 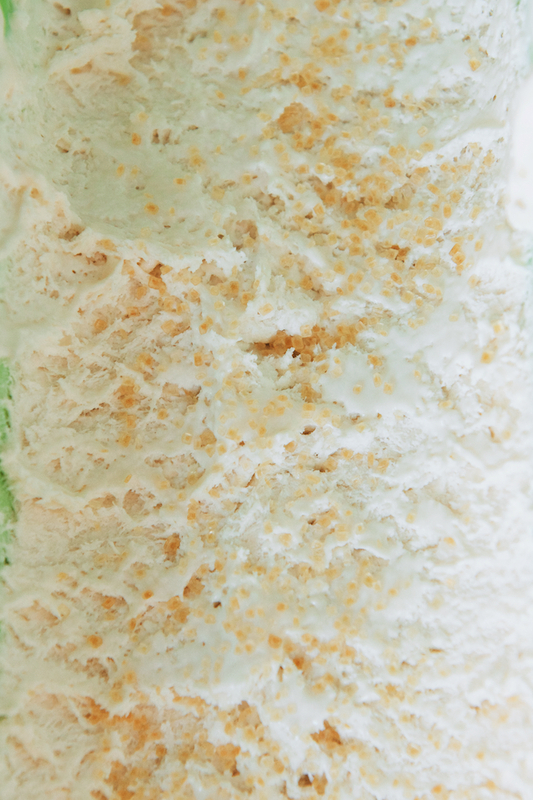 Honey pistachio ice cream. Love the flavor; would love a bit more crunch from the pistachios though. I grew up in New England where dairy farms were plentiful and where soft serve did it mean the mundane chocolate or vanilla out of a machine but rather that someone in a dairy family had the passion to create wonderful, tantalizing “hard to choose one” creamy, knock your senses to the moon kind of ice cream that would soften as you ate it ever so slowly not wanting there to be an end – but alas there was – and you dreamed about which flavor you would try next time! Gourmet ice cream is like a fine wine tasting where the smell is intoxicating and the taste – ohhhh you just let it linger a bit on your tongue and then enjoy when it slides and coats your throat – always results in a contented smile. Peanut butter and chocolate is my all-time favorite, and I always eat some on my birthday. I just got an ice cream maker and have been making a new flavor every week! My favorite thus far has been a roasted marshmallow rocky road. Would love to win that book for some new inspiration! I’m usually more of a chocolate person but I think my favorite ice cream of all times is roasted strawberry buttermilk. I don’t know what it is about buttermilk, but it makes everything better! Pistachio is my all-time favorite. I never liked it as a kid. Tried a more savory version as an adult and can’t get enough! So far, I have a tie when it comes to picking a favorite. (I’m very new to ice cream making, but have yet to make one I don’t love.) Lemon Basil and Butterscotch Pecan. Yum! i love mint brownie ice cream! i just had some dingle sea salt ice cream IN DINGLE, ireland, and it was great–clean, simple, delicious. I’m still dreaming about the rhubarb sorbet at Berthillon in Paris, intense pink, refreshing, and a puckery finish! Sounds lovely! Berthillon is definitely the ice cream shop with the best view! My favorite is Saffron & Rose in Westwood, CA. This store specializes in housemade organic ice cream in a range of regional Middle Eastern flavors. They have jasmine, saffron & pistachio, ginger, orange blossom, lavender, and rose just to name a few. I am fantasizing about all the varieties right now!